I love driving in the snow and ice. Some of my best memories driving were spent sliding around empty parking lots in my first car. Slide it in to first gear, feather the throttle, gain some speed, get the backend to step out and try to maintain the angle as long as possible. Not an easy thing to master, but executed properly, you felt like a driving god. I learned a lot about car control, maintaining momentum, weight transfer, a feel for the car gaining and losing traction and how to be confident when driving in less than ideal conditions. You can’t just mat the gas and expect to go anywhere, likewise even with anti-lock brakes just slamming the brakes isn’t going to magically stop you. Now imagine all of the fun of driving in the snow and ice, but at the wheel of a Lamborghini Aventador LP700-4 or a Hurcan LP-610-4. Lamborghini Squadra Corse is gearing-up for the first ever North American-based winter driving school, the 2015 Winter Accademia. Held at Aspen/Snowmass the event gives participants the unique opportunity to push the cars and themselves to the limit in the snow and ice. The Lamborghini Winter Accademia Program takes place February 5-7 and February 6-8, 2015 in Aspen/Snowmass, Colorado, to showcase the all-wheel-drive performance of the Aventador and the Hurcan. Participants will be taught by Lamborghini driving instructors, who will not only teach them how to handle critical winter-driving conditions, but learn techniques only taught at the Lamborghini Winter Accademia Program. Participates will share a vehicle with one other person and will get to learn emergency braking techniques, perfect driving techniques and discover the secrets to driving the perfect lap around a full road course in the snow. In order to ensure maximum amount of time behind the wheel, everything kicks off early in the morning and continues all day long. Including with the driving instruction is two nights lodging, a group dinner, breakfast and lunch at the track, and a photo and video package. As far as an experience this would be one to go to. Yes, there are other driving schools you can go to, but how many of them give you the chance to slide Lamborghinis around on snow and ice and who knows you might learn something. 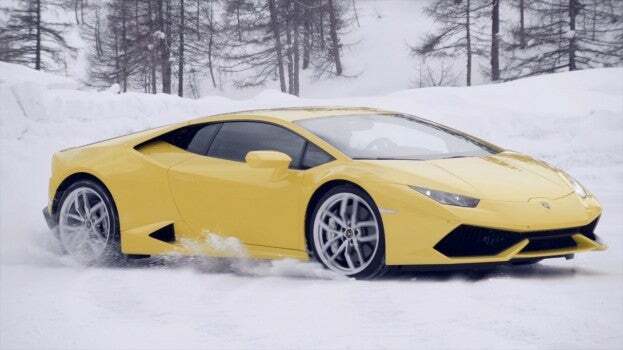 No Comments on "Lamborghini Announces Winter Accademia 2015"